Andrew Gertz has been named a Texas Super Lawyers ‘Rising Star’ by Texas Monthly Magazine for the fourth year in a row (2016, 2017, 2018, 2019). Andy is recognized for his work in real estate and business litigation. Only 2.5 percent of eligible Texas lawyers are selected to the list each year based on nominations from other lawyers, independent research and a review by separate advisory boards. Andrew has passed the written examination portion (the final portion) for board certification in Texas Residential Real Estate Law and is now officially Board Certified by the Texas Board of Legal Specialization (TBLS). TBLS certifies lawyers and paralegals that have substantial, relevant experience in select areas of law, completed continuing legal education hours in the specialty area, and passed a rigorous exam. Tom Kelley of the Gertz Law Firm secured a victory for our client, Port Arthur City Councilman Carroll Jones, in a bench trial last week. Though he's tried over 50 criminal cases, this was Tom's first civil case to try and he's now 1-0 in that regard. Congratulations, Tom! Andrew Gertz has been named a Texas Super Lawyers ‘Rising Star’ by Texas Monthly Magazine for the third year in a row (2016, 2017, 2018). Andy is recognized for his work in real estate and business litigation. Only 2.5 percent of eligible Texas lawyers are selected to the list each year based on nominations from other lawyers, independent research and a review by separate advisory boards. Congratulations! On June 20, the First Court of Appeals in Houston ruled in favor of Paul Gertz’s client, granted mandamus relief and reversed and remanded the trial court’s issuance of a temporary injunction that went against him in a commercial litigation case. Appellate Cause No. 01-16-974-CV, styled Dodd v. Evergreen National Construction, LLC, on appeal from the 164th District Court of Harris County. On June 22, the Ninth Court of Appeals in Beaumont affirmed a summary judgment that Andrew Gertz secured for his client Lancelot Homes, LLC in a mechanic’s lien foreclosure case. Appellate Cause No. 09-16-341-CV, styled Smith v. Lancelot Homes, LLC, on appeal from the 60th District Court of Jefferson County. On June 26, the United States Court of Appeals for the Fifth Circuit ruled in favor of the Gertz Law Firm’s client and affirmed the lower Court’s dismissal of a lawsuit pending against him. Andrew Gertz and Paul Gertz worked together on the appeal. Appellate Cause No. 16-40396, styled Hartman v. Walker, et al, on appeal from the U.S. District Court of the Eastern District of Texas, Beaumont Division. We are proud to announce that both Andrew Gertz and Ryan Gertz of the Gertz Law Firm have been named to the 2017 Super Lawyers ‘Rising Stars’ list published by Texas Monthly Magazine. Andrew is recognized for his work in real estate and business litigation, while Ryan is recognized for his work in criminal defense. Only 2.5 percent of eligible Texas lawyers are selected to the list each year based on nominations from other lawyers, independent research and a review by separate advisory boards. Congratulations! We are incredibly pleased to share that today, Ryan Gertz of the Gertz Law Firm secured dismissal of capital murder charges against our client, Terry Frazier. He faced life in prison if convicted. Careful review of phone records and an exhaustive investigation by Ryan showed that the police timeline of events was incorrect and that Frazier was elsewhere at the time of the crime. Ryan presented the results of his investigation to the DA's office earlier this year. You can read the Beaumont Enterprise story, by Dan Wallach, on the dismissal by clicking here: Beaumont Enterprise Story. After facing a possible life-sentence for breaking an inmate's ribs and teeth last year, an ex-Orange County jailer was found guilty of misdemeanor assault and faces no more than one year in the county jail. Brian Lee, 40, was on trial this week for first-degree aggravated assault by a peace officer for slamming inmate Jerry Carthel to the ground Jan. 26, 2015. Lee's attorney argued he acted in self-defense, trying to control a combative inmate during the booking process. Carthel's medical examination showed at least five broken ribs, but Lee's attorney Ryan Gertz said previously that the injuries were not serious enough to make this a felony case. The jury on Thursday found Lee guilty of Class A misdemeanor assault. Gertz said he appreciated the jurors recognizing his client was "dramatically" overcharged but he still believes acted in self-defense. You can read the rest of the story which includes Ryan's interview by clicking here. We are proud to announce that Andrew Gertz of the Gertz Law Firm has been selected as a Texas Super Lawyer “Rising Star” for 2016. No more than 2.5 percent of the lawyers in the state are named to the Super Lawyers Rising Stars list, which is published by Texas Monthly Magazine. A Port Arthur man's appeal of his DWI conviction is based on the validity of a field sobriety test that has been challenged across the country. The filing with the Ninth Court of Appeals in Beaumont accuses Port Arthur police officers of intentionally performing field sobriety eye exams off-camera to avoid scrutiny of their technique at trial. In August of 2015, KFDM interviewed Paul W. Gertz of the Gertz Law Firm concerning a federal lawsuit for excessive force we have filed on behalf of our client, Krystle Bob, whose initial false arrest is described below. KFDM Channel 6 News, Story and Interview Video. Ryan Gertz was recently selected from among his peers as a 2014 Southeast Texas 40 Under 40 Honoree. The distinguished Southeast Texas 40 Under 40 Awards are bestowed upon 40 young professionals under 40 who reside in the nine county area and continually acheive professional excellence in addition to diligent service in their communities. On August 15, 2014, Ryan Gertz of The Gertz Law Firm secured a "not guilty" jury verdict in an intoxication manslaughter case in Jefferson County. Intoxication manslaughter is a second degree felony that carries a sentence of 2 to 20 years in prison. Special thanks to Ed Fisher of the Provost Umphrey Law Firm for playing an integral role in the Defense. After a tragic vehicle-bicycle accident, our client was accused of being intoxicated behind the wheel. 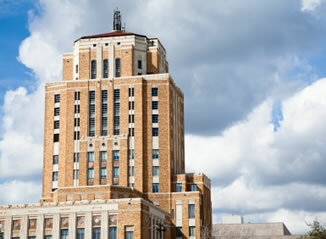 The jury found that our client was not intoxicated and acquitted her of the offense. Click the links below to view the news articles. 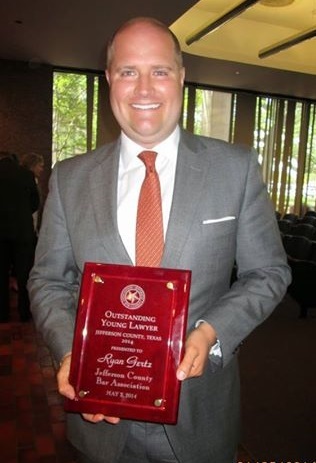 In June of 2014, Ryan Gertz won the State Bar of Texas' Publication Award for 'Best Human Interest Story' in the state for the May 1, 2013 – April 1, 2014 bar year. Ryan’s winning article, “Michael Morton and Your Worst Nightmare,” was published in the Fall 2013 Issue of the Jefferson County Bar Journal, Volume 9, Issue 3. Click here to read Ryan's article. On May 2, 2014, Ryan Gertz received the Jefferson County Bar Association’s "Outstanding Young Lawyer" Award. The award, which is given to only one attorney each year, recognizes a young lawyer who has demonstrated professional proficiency, service to the profession, and service to the community. U.S. Magistrate Judge Zack Hawthorn presented the award to Ryan at the Bar Association’s annual Law Day event.